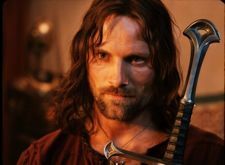 Exclusive: Is Aragorn Ready to Return for The Hobbit ? Ever since Guillermo del Toro signed on to direct two movies based on J.R.R. Tolkien’s The Hobbit for producer Peter Jackson, there has been various casting rumors about who may or may not return to reprise their roles from Jackson’s “The Lord of the Rings” trilogy. One of the cast members who seemed to be up in the air was Viggo Mortensen who played one of the most popular characters in the trilogy, the warrior Aragorn, a character who didn’t actually appear in “The Hobbit” but was included in the supplemental appendices from “Lord of the Rings” that tied the two stories together. Over a year ago, in fact shortly after del Toro signed on, Variety mentioned that Mortensen had been approached to return, but when ComingSoon.net spoke to Mortensen earlier today, he admitted that the filmmakers are currently more concerned with making the first movie, which would not include his character. Look for more with Mortensen and others before The Road opens on November 25.